Back again for its fifth year, this year’s Winter Walk will be open for 5 weeks from November 26 through December 31, 2018 with two open-air beer and wine gardens, food trucks, live performances, carolers, holiday-themed photo opportunities, lots of family-friendly activities, and other wintery surprises. Last year, Winter Walk was attended by over 750,000 locals and visitors and many more are anticipated to enjoy the festivities this year. Please note that as of 12/5/18 the times for some events still had not been announced. 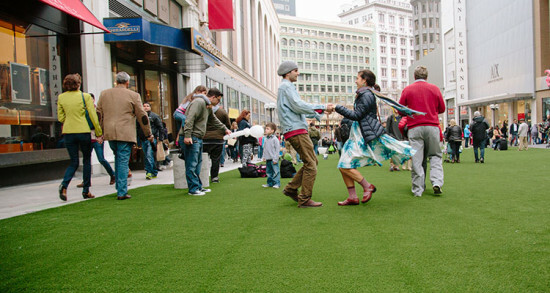 Check winterwalksf.com for updates. December 14-16 – Mary Poppins Takeover – Special Photo Wall for you to pose in front of as well as giveaways including tickets to an advance screening of the film on Monday, December 17 in San Francisco. It appears that all events are free and open to the public, but please note there may be a nominal charge for some activities.